Needless to say I hate it, but eh, what can you do. I'll try the pattern out again when I have a great yarn to do it in... I don't like the color(s), basically; the yellow really makes my own yellow (1/2 japanese) undertones cry for mercy. The superwash is a little much too, I'm thinking it'd be warm if it ever made it outside. The Cherry Tree Hill Super Glitz is a sneezing cousin of the CTH Supersock... seems like they only have a granduncle superwash in common. I found it splitty, which is a shame since the pattern can be eyes-free-- and the hand, while not scratchy or hard, left something to be desired (could be cos I set down Hedera to work on this, could be that a strand of glitter isn't the softest thing in the world!) 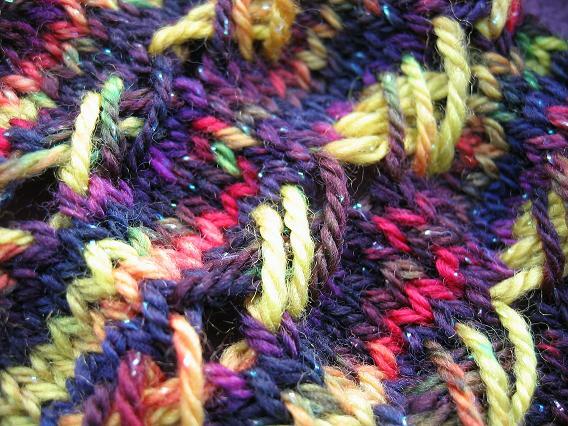 It did wash/block into a softer fabric than the pre-blocked fabric, and I wouldn't hesitate to use it for socks. I have a lot more of the super glitz that I'll eventually work into socks, and don't have a real complaint about it except the splittiness. Have fun at the sale! There's never anything like that around here where I live. I brought some store yarn home to make a tank top for display. It's knit with Patons Brilliant. We've sold some, but not a lot. This will be my first time using it, and by the looks of it it's going to be splitty! It has a sparkle in it, too. I think it will be a nice top if I can suffer through it! I won some Lorna's Laces on eBay. They have some more, and I may order two or three more skeins - shipping is the same. May as well take advantage, I guess! 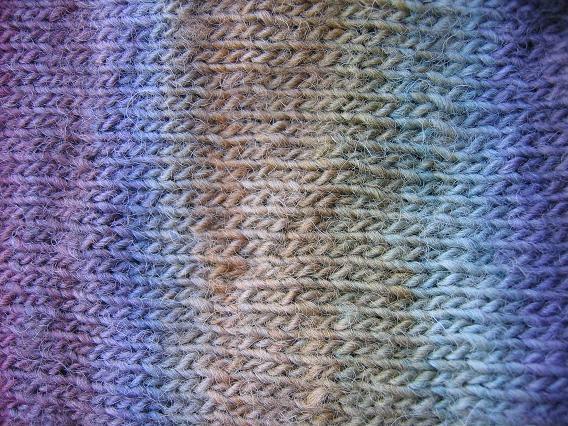 Oooh that SantaCruz yarn is beautiful, such smooth color transitions! Take lots of pics of your purchases from the sale (drooling over here on the East coast). I'm knee-deep in baby acrylic for a while, but can't wait to get back to spinning. fab colors of the secret project. I also submitted to Whiplash. I *love* Imagiknit! I wish I had money to go shopping, they literally have every yarn you wish you could see in person! Have a great time! *sigh* I ripped out the lace. I just couldn't get past that early mistake. I'm not working with lifelines. I never have before, and I'm not exactly sure how you do it. 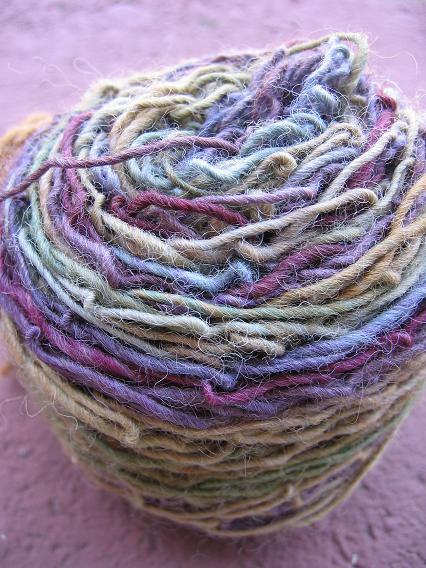 It's not easy dealing with a million yarnovers on laceweight. I love that Santa Cruz yarn. 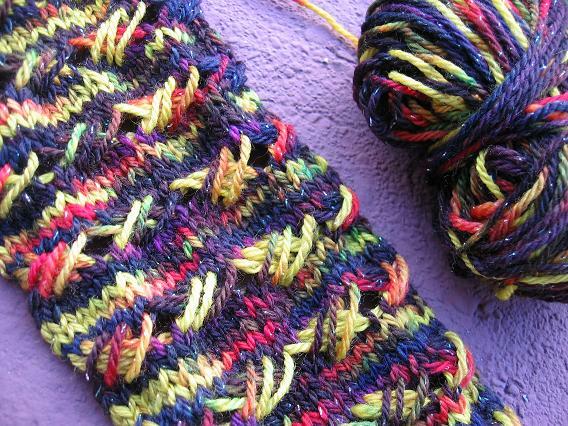 It looks like it is knitting up so nicely. Great colors! And I like the colors in the headwrap too. That yarn is so pretty! 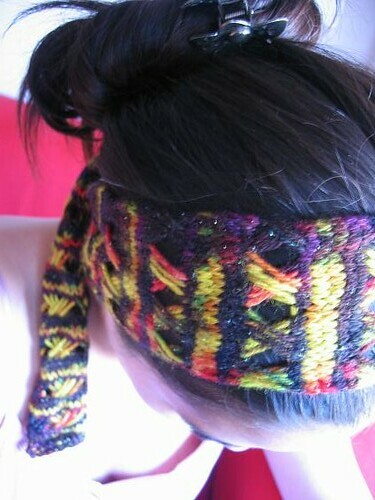 The headband is kinda funky - the yellow makes it pop!